(Nanowerk News) In a marathon, everyone starts at roughly the same place at roughly the same time. But the faster runners will gradually increase their lead, and in the end, the distribution of runners on the street will be very broad. Something similar happens to a pulse of light sent through a medium. The pulse is a combination of different colours (or different wavelengths), and when they are sent through a medium like glass, they travel at slightly different speeds. This leads to a dispersion effect: the pulse becomes longer and longer. But there are ways to reverse this. It is possible to use a medium to make a laser pulse shorter. Scientists at the Vienna University of Technology have found a way to compress intense laser pulses by a factor of 20 to just 4.5, just by sending them through a cleverly designed hollow fibre. The compressed laser pulse only consists of a single oscillation of light. This tabletop technology is much simpler and cheaper than previously used complicated setups. It has now been published in Nature Communications ("A strong-field driver in the single-cycle regime based on self-compression in a kagome fibre"). An infrared laser pulse is sent into a hollow fibre filled with gas. The nonlinear interaction between the light and the gas atoms in the special fibre makes different wavelengths travel at different velocities. The components with longer wavelengths travel faster than the short wavelength components. Inside the fibre, however, there is a carefully designed nanostructure, which allows short wavelengths to travel through the fibre faster than longer ones. The combination of these two opposing effects leads to a compression of the laser pulse. It is like sending off a long line of marathon runners and in the end have them all arrive at the finish line simultaneously. The resulting pulse is not only short but also extremely intense: it reaches a peak power of one gigawatt. The nanostructure inside the fibre is called "Kagome", which is Japanese for "basket weave". This special fibre that allows undistorted transmission of these extremely short pulses was designed and fabricated by the research group of Fetah Benabid at Limoges University, France. For years, extremely short infrared laser pulses have been used to unravel the secrets of the quantum world. They can rip electrons away from their atoms, they can accelerate electrons, they can help to monitor the dynamics of chemical reactions. 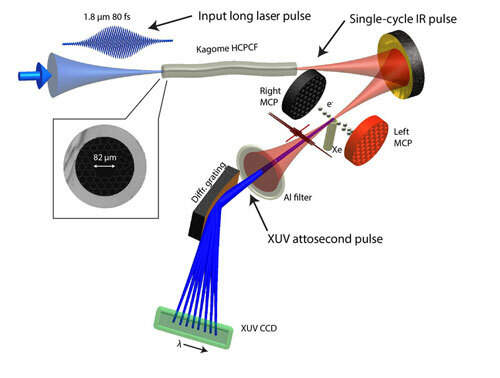 Up until now, complicated setups had to be used to create these femtosecond laser pulses. Usually, the different wavelengths of the pulse have to be manipulated with intricate mirror systems to compress the pulse. This simple pulse compression method should make it much easier and cheaper for laboratories all around the world to create single-cycle infrared pulses and is a key step for generating even shorter, the attosecond pulses. In their recent publication, the researchers at the Vienna University of Technology have already demonstrated that their laser pulses can be used for highly advanced experiments: they focused the pulse onto a target of xenon gas, ionizing the xenon atoms. Depending on the exact shape of the laser pulse, the electrons ripped away from the xenon atoms can be sent into different directions. "It is an ultrafast electron switch", says Tadas Balciunas. The photonics team at the Vienna University of Technology is planning to use this new technology for a variety of measurements in the future and expects other research groups around the world to pick up this idea. 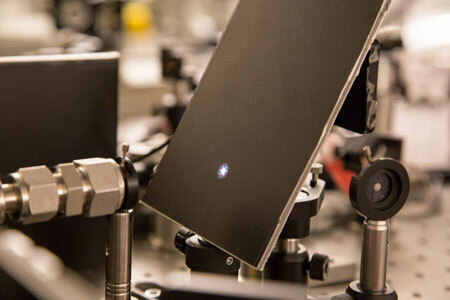 Having a femtosecond laser system which is cheap, small and easy to use could turn out to be a boost for attosecond science and ultrafast laser research in general.